Dan appeared on Good Morning America this morning to continue discussing the Seacat Trial, about the former police officer, Brett Seacat, who shot and murdered his wife. 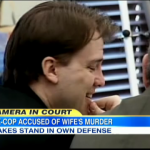 The prosecution claims that Brett Seacat killed his wife two days after she handed him divorce papers. Seacat gave the impression that he was trying to explain away anything that could give the impression that his actions were premeditated. Dan comments, “The problem is, though all of his answers make total sense, right? Hard drive, want to get rid of it because you don’t want identity thieves. Don’t want to leave your cell phones around, so you discard old cell phones, etc. The problem is, this all happened right before his wife dies. You put that in conjunction with the other evidence in this case – that’s the he’s got.” Watch the segment here. Law&Crime Network teams up with PodcastOne to launch legal podcasts with Live PD’s Dan Abrams kicking off. Copyright www.dan-abrams.net. All rights reserved. Web Design by Sound Strategies.